Have you ever tried fish therapy? I watched them on the TV long time ago and always wanted to try it. Finally I had a chance to do it at the Spa World in Osaka!! 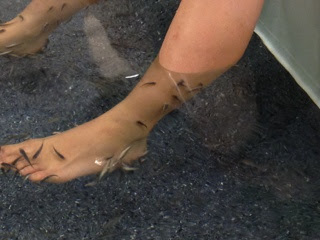 The fish are called "Garra rufa" also "Doctor fish". When we put our feet in the pool, they eat only the dead areas of the skin and leaving the healthy skin to grow. I have no idea how it feels like, because when I watched TV, some comedians were screaming to do it. I thought it might be a little bit sore, but it wasn't - It was fantastic!!! It feels like there are tiny electric shock happen on my legs. It was ticklish at the beginning but 10minutes later, my legs looked much whiter and my toes looks so clean and it was so refreshing! Normally animals run away when we approach them, but doctor fish are actually approach you and that was amazing feeling. I tried it first, and my mum and her fried were watching, but they decided to try it as well. I forgot that she was so ticklish person!!! But she was all right after some time and we really enjoyed it very much! I highly recommend this therapy. Please try it if you have a chance! I didn't know there is Fish therapy available at Spaworld!